Most rock ’n’ roll documentaries, as good as they may be, employ a pretty straightforward methodology: Look up the subjects, interview them and the people closest to them, and edit it all together. With Don’t Think I’ve Forgotten, director John Pirozzi didn’t have that luxury. The subject of his documentary is the unique, fertile rock scene of Cambodia in the ’60s and early ’70s, a time when the Vietnam War pressed across the nation’s border, along with the influence of American and European pop. But Pirozzi couldn’t simply sit down and interview most of the participants in that scene: The majority of them were murdered by the Khmer Rouge as part of its bloody, purportedly culture-cleansing genocide in the late ’70s, a massacre that left few traces—recorded or living—of a once vibrant musical community. Pirozzi overcame that horrifying obstacle the hard way. He dug. Don’t Think I’ve Forgotten is pieced together from first-person accounts of some of the survivors of the Cambodian music scene, as well as those of family members, fans, actors, architects, members of Cambodia’s royal family, former U.S. policymakers, and others who were impacted by, and had an impact on, the sociopolitical upheaval of Pol Pot’s Communist Khmer Rouge. The absence of some of Cambodia’s biggest pop stars of the past—including Sinn Sisamouth, “father of popular music in Cambodia,” who was likely executed by the Khmer Rouge in 1976—is as haunting as the testimonials by those who knew, loved, and were forever changed by his blend of traditional Cambodian music and the Western influence of French, American, and Cuban sounds. 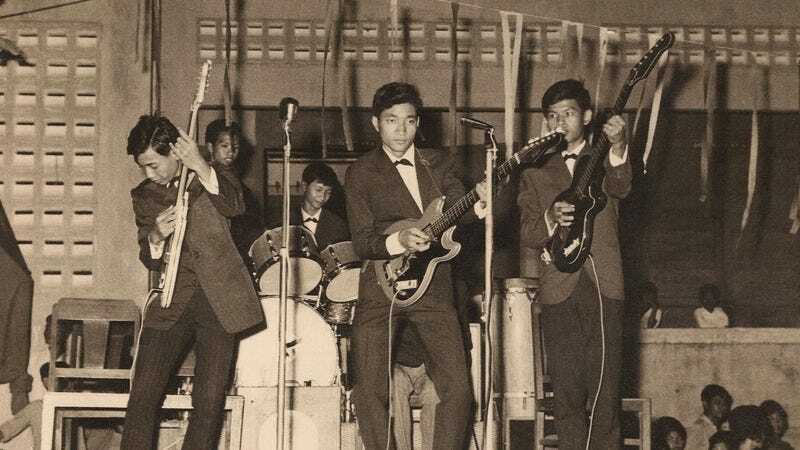 Through the history of its major players, the history of Cambodian popular music is traced, from its twangy-guitar genesis in the late ’50s to the eventual adoption of R&B, hard rock, and hippie-inspired psychedelia. Brothers Mol Kagnol and Mol Kamach of the band Baksei Cham Krong recount the way their style changed as fresh influences were imported from the rest of the world, turning the Cambodian scene into a unique melting pot of genres that managed to maintain a native identity. Pirozzi’s liberal use of archival footage isn’t the usual rock-doc filler; here it’s gorgeous, hypnotic, and atmospheric, as is Scot Stafford’s ghostly score, which harmonizes sometimes tenderly, sometimes harrowingly with the anthems of Cambodia’s past. Pirozzi’s previous documentary, Sleepwalking Through The Mekong, followed the Cambodian-American rock band Dengue Fever on a tour through Cambodia, but Don’t Think I’ve Forgotten is a far superior and more substantial piece of filmmaking. It might have been tempting to put Dengue Fever in Don’t Think I’ve Forgotten, but Pirozzi wisely resists. Instead of dwelling on the state of Cambodian music as a whole, he keeps his focus on the moment in history when the innocence and exuberance of the country’s music scene tragically overlapped with an ideological agenda that viewed the friction between artistic expression and political purity as a zero-sum game. Due to the nature of Pirozzi’s subject, he’s able to offer far more questions than answers; it’s not known when or how most of the members of Cambodia’s bygone rock scene were killed, and it’s a testament to his skill as a documentarian that these factual gaps heighten rather than detract from the drama. As expressionistic as it is journalistic, Don’t Think I’ve Forgotten triumphs as both an objective record and a poetic lament: It’s a film that’s every bit as entrancing and haunting as the lost music it celebrates.